Combine the warm water and yeast in a large bowl. Let the mixture stand until yeast is foamy, about 5 minutes. Stir in butter, sugar, eggs and salt. Beat in flour, 1 cup at a time, until dough is too stiff to mix with a spoon (some flour may not be needed). At this point, use dough hook or knead on floured surface for 10 minutes until dough is smooth. Place in a greased bowl and cover. Let rise until doubled, or at this point it can be refrigerated for up to 4 days. Grease one 16.5×12-inch or two 12×9-inch baking pans. Divide dough into 24 equal-size pieces (about 50 grams each). Roll each piece into a smooth round ball; place balls in even rows in the prepared pan. Cover and let dough balls rise until double in volume, about 1 hour. (Remember if you are using dough that has been refrigerated and is cold this step will take longer). Preheat oven to 375°F Bake until rolls are golden brown, 15-20 minutes. 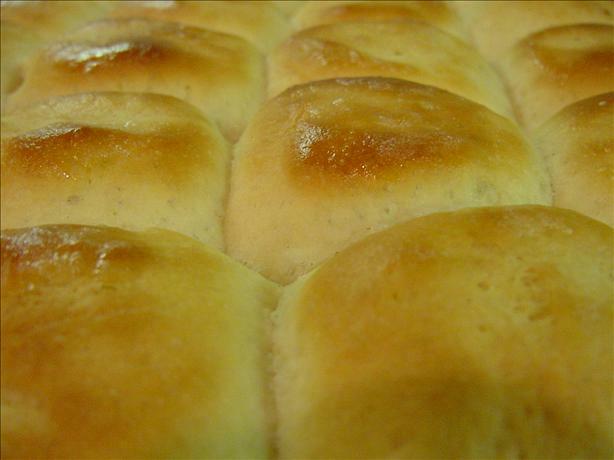 Brush warm rolls with melted butter, if desired. Break rolls apart to serve.